Joan and Jazmyn Douillard are the mother-daughter team that runs Williams Lake’s only dedicated toy store, the Realm of Toys. This year they’ve turned the Realm of Toys Easter Egg Hunt into the Realm of Toys Easter Egg Festival. Patrick Davies photo. The Realm of Toys is all set to expand its annual Easter Egg Hunt into an Easter Festival this year on April 21, Easter Sunday. For the last few years now daughter-mother team Jazmyn and Joan Douillard of the Realm of Toys have hosted the annual Realm of Toys Easter Egg Hunt for the children of Williams Lake. Jazmyn said that, as time went on, the event grew beyond the store with lines stretching down the street making it necessary to hire and invite entertainers out for the crowd. “This year we decided we’re just going to close down the street and fill it with entertainment,” said Jazmyn, who received approval from city council Tuesday, March 30 for the street closure. 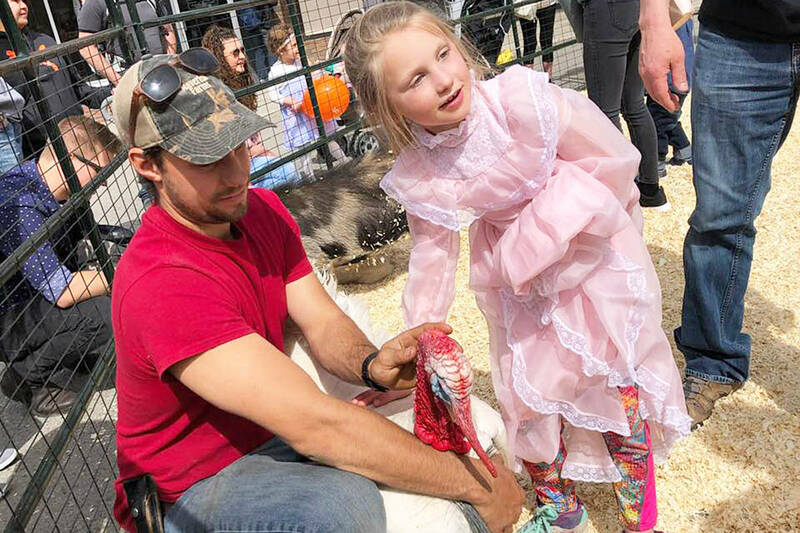 For the Realm of Toys Third Annual Easter Festival, there will be everything from magicians to facepainting and more with Hattie and Amos Entertainment, Maverick Farms petting zoo and a half dozen others already confirmed. Adventure Games will also be presenting VR demos at their Memory Den site, while a Quesnel-based company is bringing their video game party bus to the festival. Rather than holding the growing event in the Realm of Toys store, the egg hunt will instead be on the grounds of the Potato House this year. This move comes in part due to concerns about theft in the store but also the fact that, even when they moved locations, they continued to find missing and lost Easter eggs scattered throughout their merchandise. Also, hosting the event outside and in a garden setting just makes more sense to Jazmyn as far as the theme of an Easter egg hunt goes. When asked how the hunt would work this year Jazmyn said it has been a learning experience. The first few years they did it, they hid actual candy throughout the store which led to some children taking too much and others getting too little. While in previous years the event has been completely free, this year Jazmyn is making it by donation, though she said they would not turn anyone away unable to make one. All money that will be taken in for admittance to the hunt and pictures with the Easter Bunny will go directly to the Potato House, which she says needs the funding. Partnering with the Realm of Toys to put on the event is the Williams Lake and District Credit Union and a few other silent sponsors. To host all of this Jazmyn has already secured permission from the City of Williams Lake to shut down the street from the intersection of Second Avenue and Oliver Street down to First Avenue and Oliver Street. Vendors, entertainers and even bouncy houses will line this blocked off stretch of road from 12 p.m. to 3 p.m., including a young boy who will set up a lemonade stand. Jazmyn expects the festival to be busy, as last year their Easter egg hunt attracted close to 350 children, not counting their parents or guardians. She asks that due to the petting zoo, people refrain from bringing dogs without a “firm hand” on the leash. “It’s like Halloween. It always grows and we’re just amazed by the amount of people that show up each year,” Joan added. As the weather is likely to be warm by the end of April, Joan hopes to attract more senior citizens to the event. Jazmyn agreed and added they’re looking at adding more lawn games and other activities seniors can more easily take part in. Jazmyn said they are also currently looking for a few more volunteers to work security and traffic for the event. She said they’re good on the first aid side of things but could use four or six more people to just help ensure the event runs safe and smooth.